Megyn Kelly Apologizes For Blackface Comments - Joe.My.God. Megyn Kelly’s apology note to NBC News colleagues after her comments about dressing in blackface at Halloween made its way onto social media. In the memo, the Megyn Kelly Today host said she has “never been a ‘PC’ kind of person” but that she understood “we do need to be more sensitive in this day and age.” It was posted to Twitter by BuzzFeed News reporter Remy Smidt. “I realize now that such behavior is indeed wrong, and I’m sorry. The history of blackface in our culture is abhorrent; the wounds too deep,” Kelly wrote. 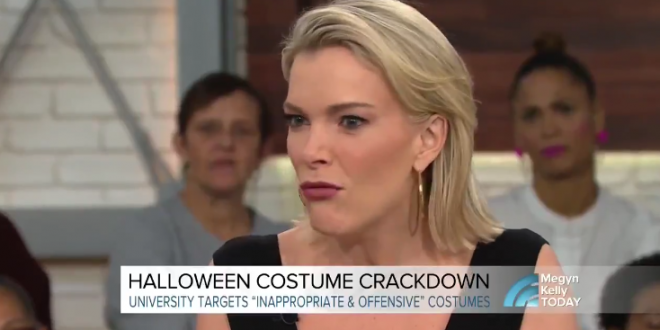 In the opening minutes of her 9 a.m. show, “Megyn Kelly Today,” the host was in a round-table discussion with the former “Fashion Police” host Melissa Rivers and two NBC colleagues — Jacob Soboroff and Jenna Bush Hager — to discuss how “the costume police are cracking down” on Halloween costumes, as Ms. Kelly put it. Ms. Kelly went on to cite the example of Luann de Lesseps, a cast member of “The Real Housewives of New York,” who came under fire this year for dressing up as Diana Ross, complete with an outsize Afro wig. Ms. Kelly added that she found the criticism of the “Housewives” star perplexing. Kelly, you surely recall, has previously held that both Jesus and Santa Claus are definitely white. For all the white people out there who missed the many, many memos on this, blackface is horrifically offensive. Don’t do it. Not for Halloween, not for a joke, not for any reason. Hi @megynkelly.